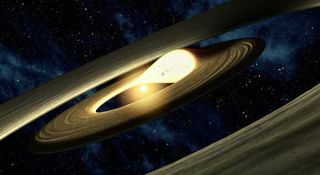 Although it may take millions of year for swirling clustersof interstellar gas and dust to become a mature planet, scientists havediscovered that rapid changes can be observed even within a fraction of thattime span.? Over the course of five months, the researchers observedthat the infrared light from adisk of gas and dust around LRLL 31, a young star, tended to vary inunexpected ways. This suggests that another star ? or perhaps a planet ? isshoving the clump of planet-forming material around, which causes its thicknessto vary as it spins around the star. The observations were made using NASA's Spitzer SpaceTelescope. Before Spitzer was launched in 2003, only a few transitional diskswith gaps or holes were known. With Spitzer's improved infrared vision, dozenshave now been found. The space telescope caught the warm glow of the disks,which allowed researchers to map out their structures. "We don't know if planets have formed, or will form,but we are gaining a better understanding of the properties and dynamics of thefine dust that could either become, or indirectly shape, a planet," saidJames Muzerolle of the Space Telescope Science Institute. "This is aunique, real-time glimpse into the lengthy processof building planets." Somehave theorized that as dusty grains swirling around a star in a disk, and beginto bulk up in size on their way tobecoming a planet, they carve out gaps in the dust until a transitionaldisk takes shape with a large doughnut-like hole at its center. Eventually,this disk fades and a new type of disk emerges, made up of debris fromcollisions between planets and asteroids and comets. Over time, a more settledand mature solar system like our own forms. Muzerolle and his team focused on a family of youngstars in the IC 348 star-forming region of the constellation Perseus, manywith known transitional disks. The stars are about two to three million yearsold and about 1,000 light-years away. Although a few of the stars showed surprisinghints of variations, the astronomers decided to study LRLL 31 over a five monthperiod. Light from the inner region of the star's disk changes every few weeks --sometimes in only one week. Both the intensity and the wavelength of infraredlight varied over time. For instance, when the amount of light seen at shorterwavelengths went up, the brightness at longer wavelengths went down, and viceversa. Muzerolle and his team think that a companion to the star circling in a gapwithin the system's disk could explain the findings. "A companion in the gap of an almost edge-on disk wouldperiodically change the height of the inner disk rim as it circles around thestar: a higher rim would emit more light at shorter wavelengths because it islarger and hot, but at the same time, the high rim would shadow the coolmaterial of the outer disk, causing a decrease in the longer-wavelength light.A low rim would do the opposite. This is exactly what we observe in our data,"said Elise Furlan, a co-author from NASA's Jet Propulsion Laboratory. NASA?s Spitzer Space Telescope will again be used, this timeto observe the system in its "warm" mission to see if the changes areperiodic, as would be expected with an orbiting companion.